Carine ne Britannia is the Fifth Princess of the Britannian Imperial Family and the same age as Nunnally. 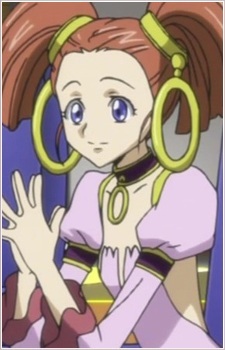 Her personality is the exact opposite of Nunnally's, deriving pleasure from war and violence. She appears to dislike Nunnally for her pacifist stance even though Odysseus asks her to be nice with her. She is in the Royal Court after the one month time skip, where, under the influence of Lelouch's Geass, she accepts him as the new emperor. She is then employed as a maid, along with her elder sister Guinevere, the only other known living Britannian Princess not acommpanying Schneizel. Her fate after the destruction of Pendragon is unclear.